Law stated in this book is as amended upto 1st August, 2018. ICAI have come up with Articleship Assessment Examination.This is a compulsory test which students will have to appear after completion of 1st & 2nd year of Articleship. 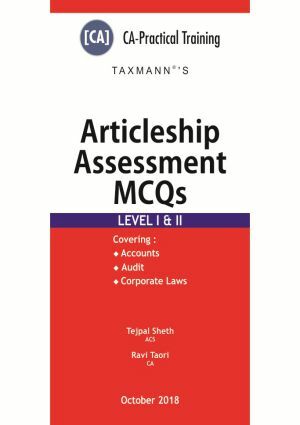 In this book, MCQs have been framed as per sample MCQs issued by ICAI and practical training generally imparted to CA students. These MCQs will enhance students’ knowledge and make him ready for exam.